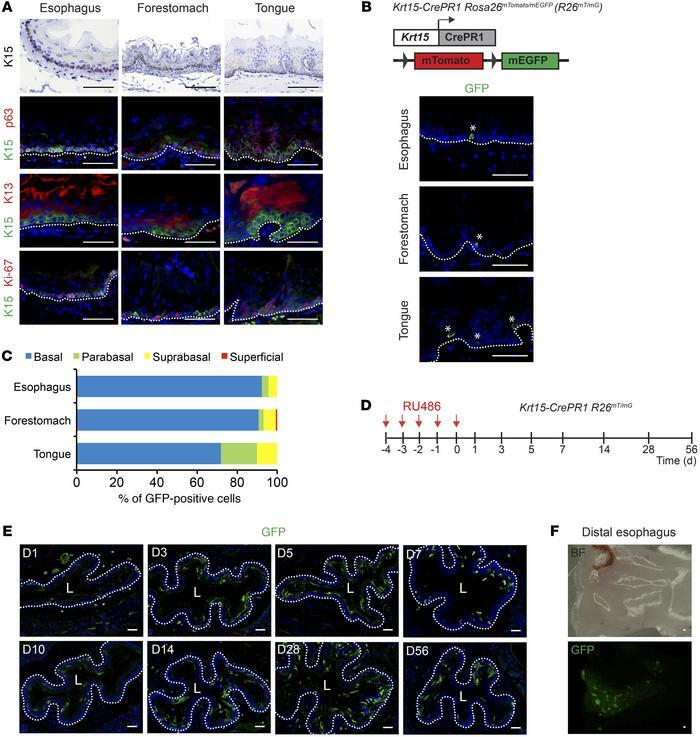 Krt15 marks long-lived basal cells in the mouse esophageal epithelium. (A) Top panels: Localization of K15 in the mouse esophagus, forestomach, and tongue. Lower panels: Colocalization of K15 with p63, K13, or Ki-67 used as basal, suprabasal, and proliferative cell markers, respectively. (B and C) Krt15-CrePR1 R26mT/mG mice were injected with 0.5 mg RU486 and sacrificed 24 hours later. (B) Localization of GFP-labeled (Krt15+) cells in mouse esophageal, forestomach, and tongue epithelia. Asterisks indicate recombined cells. (C) Graph represents the percentage of total GFP cells localized in each compartment (mean of 4 mice; cross sections of 4 different regions of the esophagus were analyzed for each mouse). (D–F) Krt15-CrePR1 R26mT/mG mice were injected daily with 0.5 mg RU486 for 5 consecutive days and sacrificed at listed time points. (D) Schematic illustration of RU486 treatments and sacrifice times for the genetic lineage tracing experiments. (E) GFP (Krt15+ cells) immunofluorescence in esophageal sections of Krt15-CrePR1 R26mT/mG mice. (F) Whole-mount esophagus imaging of Krt15-CrePR1 R26mT/mG mouse sacrificed 6 months after Cre recombination. “L” indicates the lumen; dotted line marks the basement membrane. Scale bars: 50 μm.